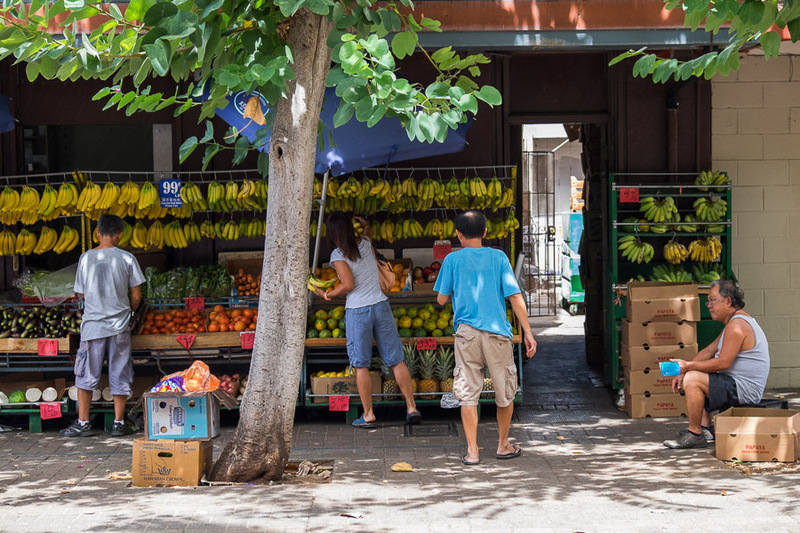 I had booked us in for a tour on our second day in Honolulu – the Hole in the Wall Food Tour. We skipped breakfast that morning and were well and truly ready to eat when the van arrived to pick us up just after 9am. Driving the air-conditioned vehicle was our Tour Director Robin, assisted by Tour Guide Krystal. They took us on a ride through Honolulu which included several tasty stops and a walk through Chinatown. 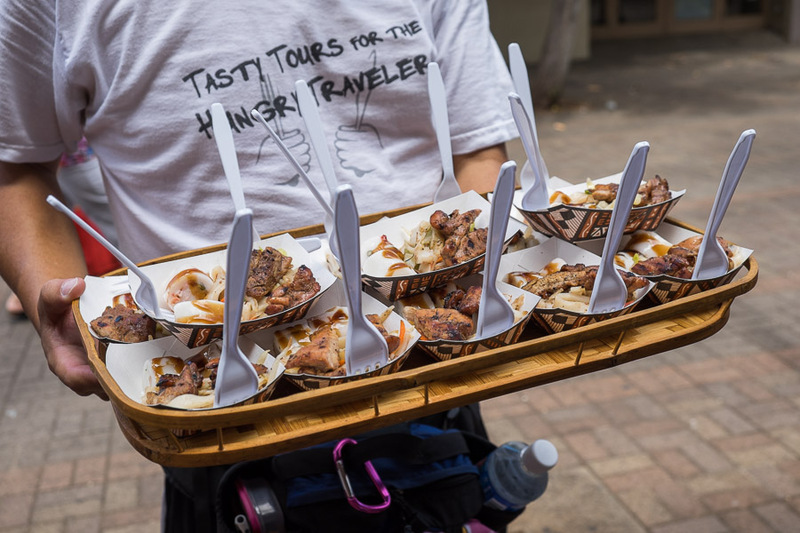 As they explained, this tour isn’t about traditional Hawaiian food; it’s about Hawaii’s local food, which really is a melting pot of international flavours. 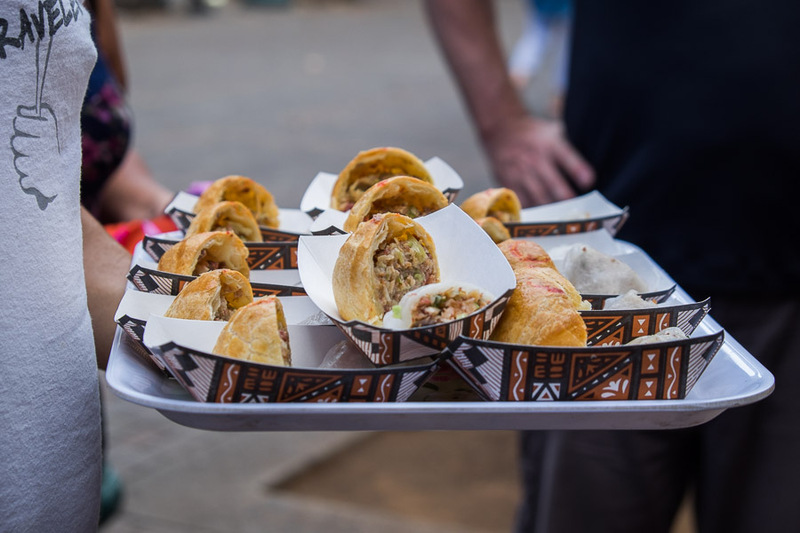 First stop was Royal Kitchen for baked manapua – a Hawaiian-Chinese fusion baked bun. 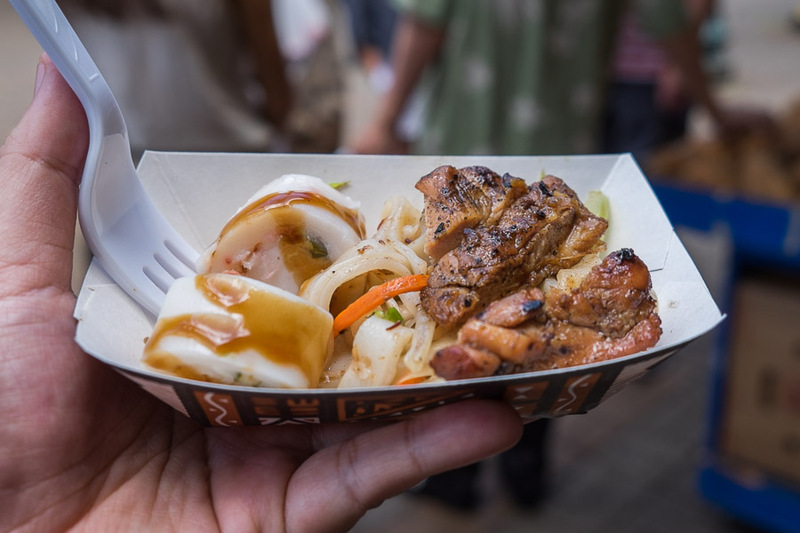 We were invited to choose from the available fillings which included Hawaiian smoked kalua pork, Portuguese sausage, Chinese sausage (lup cheong), curry chicken, purple sweet potato, coconut and Chinese black sugar. 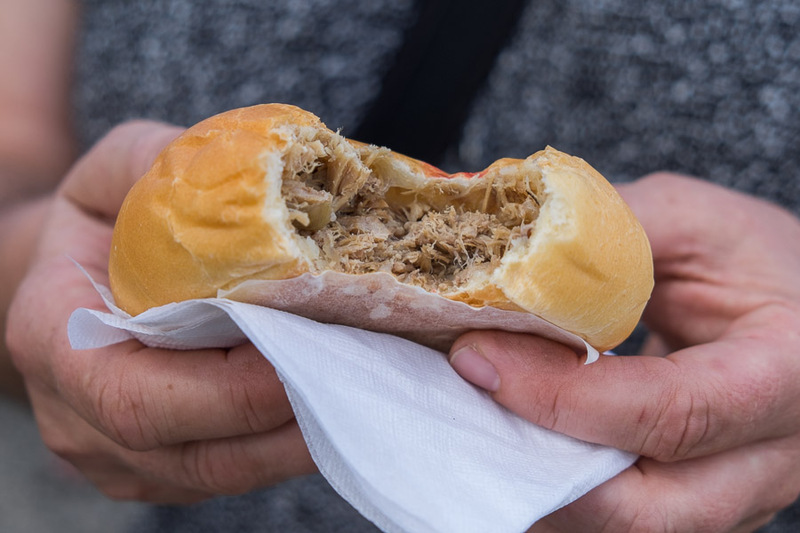 The name ‘manapua’ was the local name for char siu pow, the buns sold by Chinese immigrant hawkers – mea ono pua’a (“mea ono” for cake or pastry, and “pua’a for pork). It was difficult to choose just one flavour and I changed my mind multiple times before committing to curry chicken. Jac got kalua pork. We both enjoyed our buns. 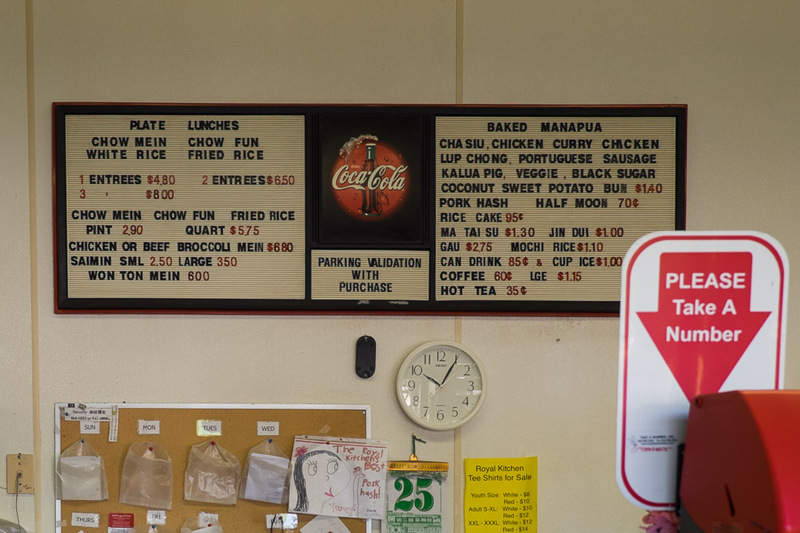 When we return to Honolulu (a real possibility in the next couple of years, I reckon) I’d like to come back to Royal Kitchen for more manapua. We stopped at Liliha Bakery for coco puffs – cream puff shells (choux pastry) with creamy chocolate filling, topped with buttery Chantilly frosting. 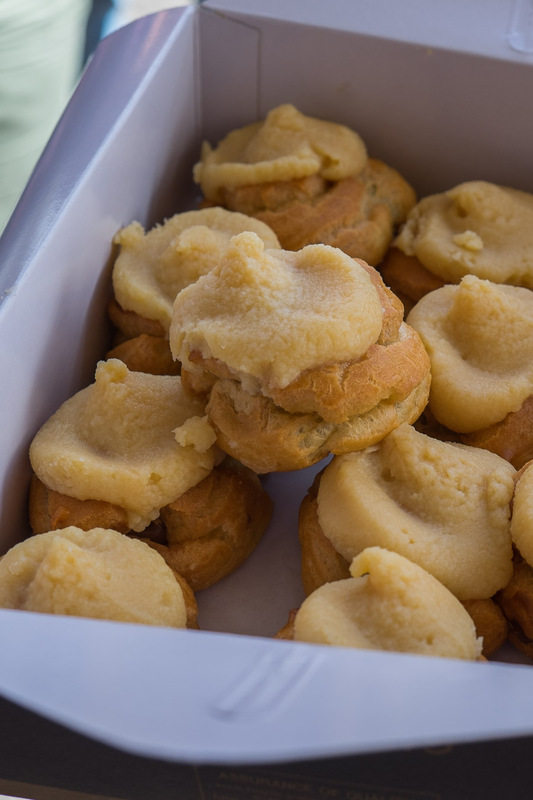 I discovered these when I first started researching our Hawaiian trip and was amazed to learn that Liliha Bakery sells over 5,000 of these pastries daily. 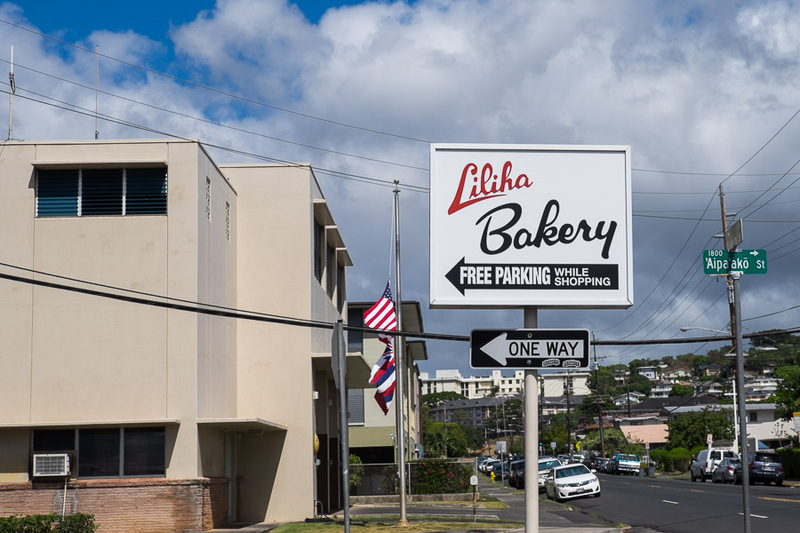 Liliha Bakery was a family business established in 1950 on Liliha Street. The shop moved to Kuakini Street (where it is now) in the 1960s but kept the Liliha name. 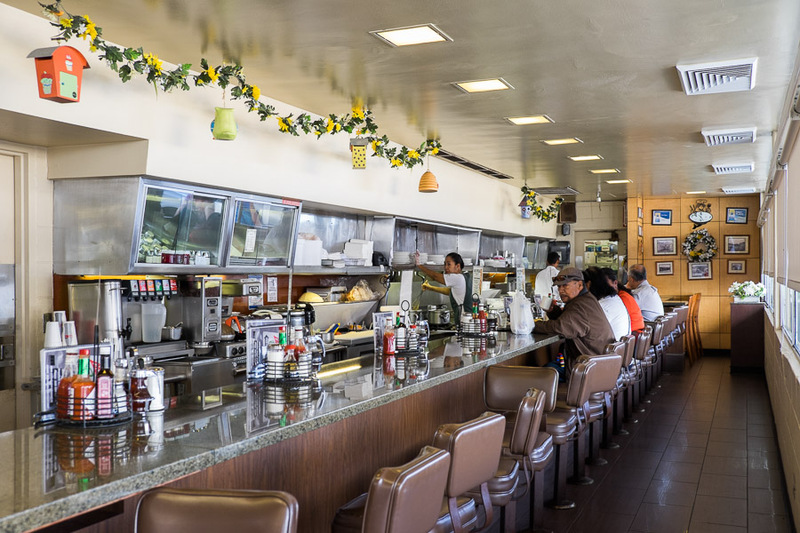 When you enter, Liliha bakery is to the left, Liliha Coffee Shop/Diner is to the right. It’s open 24 hours 6 days a week (closed on Mondays). The bakery sells a range of cakes and pastries, but are most famous for the coco puffs – cream puff shells with chocolate filling, topped with deceptively rich and buttery Chantilly frosting. There’s now a new coco puff flavour – green tea. We sampled the original flavour. Tour Director Robin used to be a chef before joining the Hawaii Food Tours team, working his way up from dishpig to pastry cook at Alan Wong’s Pineapple Room and Executive Chef at Nobu Waikiki). He and Krystal were excellent tour guides, personable and knowledgeable. 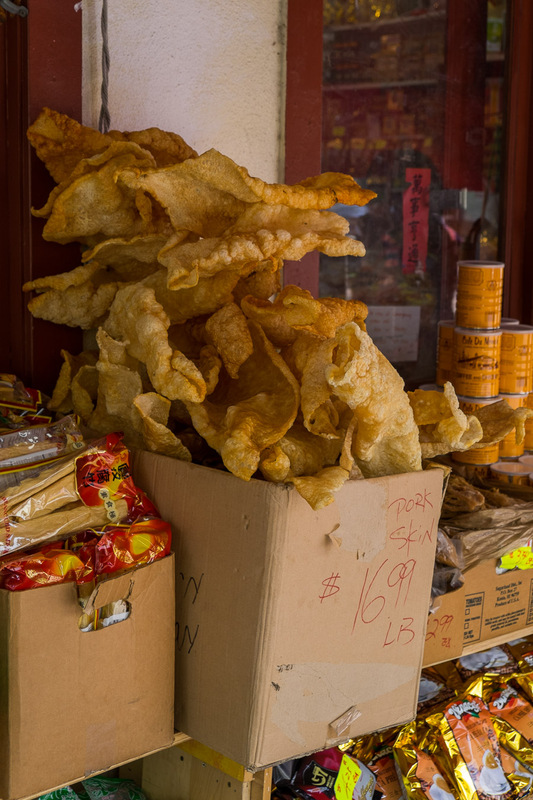 Spotted on our walk through Chinatown – crispy pork skin, $16.99 a pound. 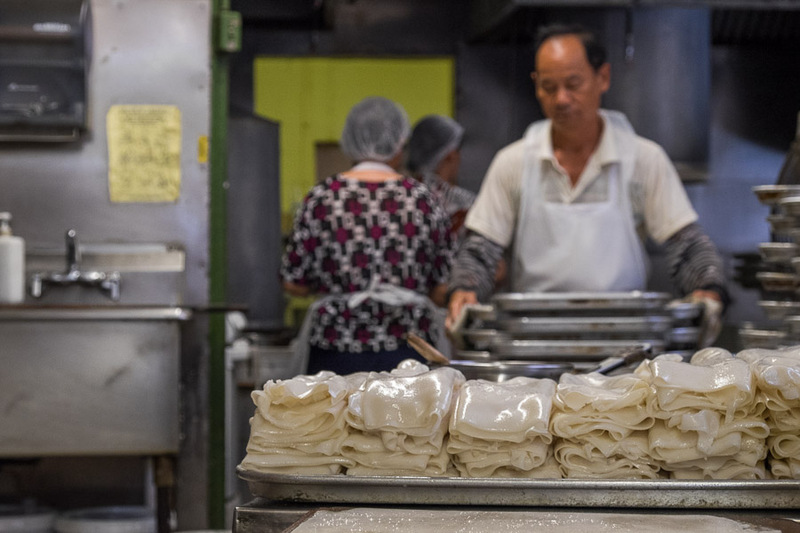 In Chinatown, we watched fresh chow funn noodles being steamed, folded and stacked into silky bundles at Ying Leong Look Funn Factory, which has been in operation for over 50 years and supplies fresh rice noodles to many local restaurants. The session at the noodle factory gave me a terrible craving for noodles. To my delight, Krystal was waiting outside the noodle factory to serve us stir-fried chow funn noodles with Korean BBQ chicken (from Jackie’s Corner inside the Maunakea Marketplace in Chinatown). We also tried ma tai su (Chinese pot pie) and steamed half moon dumplings from Sing Cheong Yuen Bakery on Maunakea Street. Next, two local classics. First, SPAM musubi (SPAM sushi). Regular readers will know I’m a big SPAM fan, so you can imagine how pleased I was to visit Hawaii – Hawaiians love SPAM and consume over 7 million cans a year, more than any other state of the US. 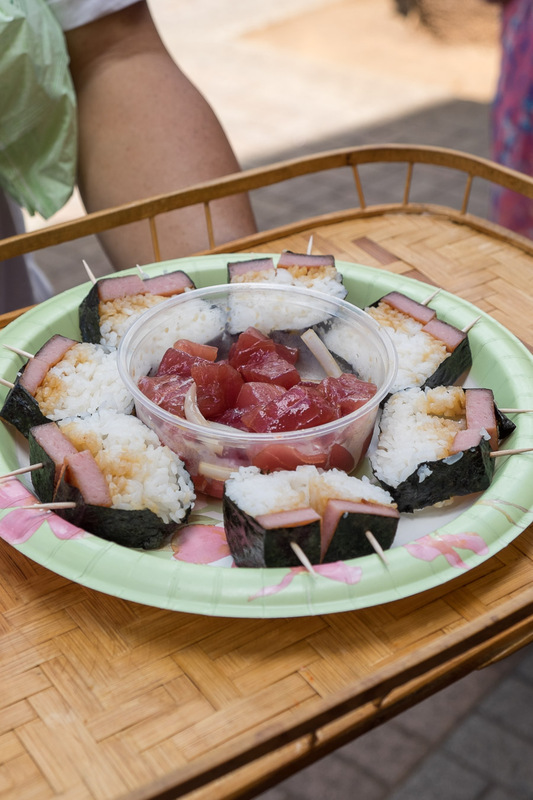 Hawaii’s love of SPAM began in World War II. The Hormel Company, which manufactures SPAM, kept Allied troops well supplied with cans of SPAM – it became a staple for not only soldiers, but for geographically-isolated Hawaii in war time because it was cheap and filling, didn’t need refrigeration, and had a long shelf life. And so from those World War II days, SPAM worked its way into local cuisine and today is ubiquitous and beloved in Hawaii. SPAM musubi, for example, is a popular snack you’ll find for sale in convenience stores, SPAM (multiple varieties) is a staple item at supermarkets, Burger King has served SPAM and eggs, and McDonald’s continues to feature SPAM in its Big Breakfast (I went to McDonald’s in Waikiki just for that – it was awesome!). I even had a fancy version of SPAM with fried rice for breakfast at local celebrity chef Alan Wong’s Pineapple Room restaurant. Anyway, stay tuned for more of my Hawaiian SPAM adventures. We also got to eat more ahi poke (rhymes with okay). I wrote about our first taste of poke on our first day in Hawaii). We absolutely loved it and were pleased to have the chance to eat more. The marinated raw tuna was not to everyone’s taste, so Jac and I (and a couple of keen others) got to have seconds; Jac even had thirds, encouraged by Robin, to help finish it all off. We washed it down with Krystal’s special lychee vodka pineapple smoothies. 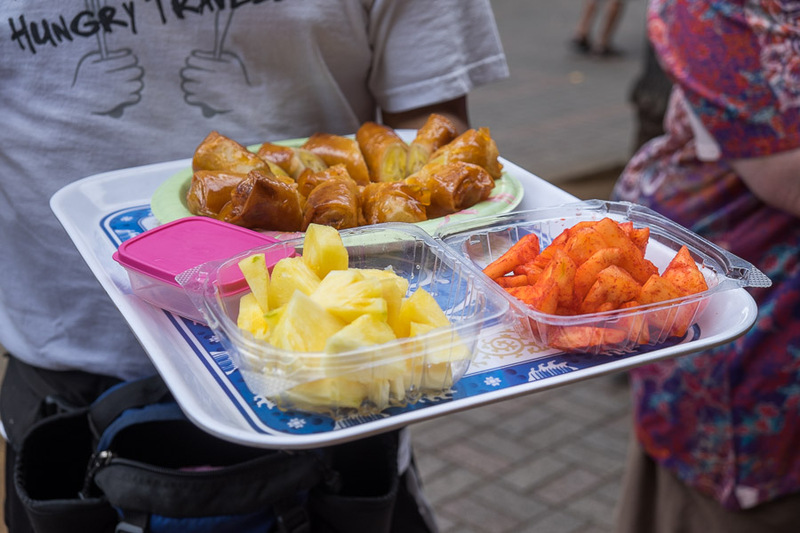 We tasted local fruit: longan and dragonfruit (not pictured), then fresh Maui Gold pineapple – plain, and dusted with Li Hing (preserved plum) powder and apple banana lumpia. We went on the Maui Gold pineapple tour when we got to Maui – that blog post is still to come. 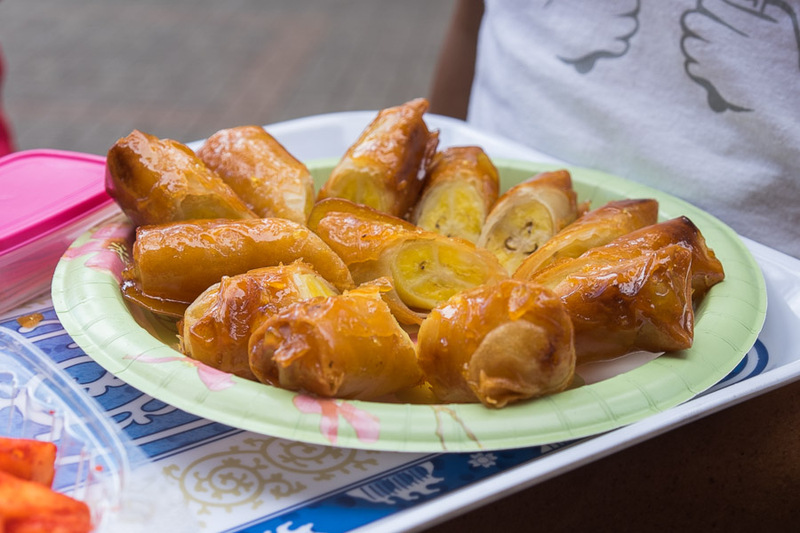 Apple banana lumpia – the bananas are a locally grown variety called ‘Hawaiian Candy Apple Bananas‘. They are wrapped in spring roll skins and coated in a sticky, crunchy caramel. 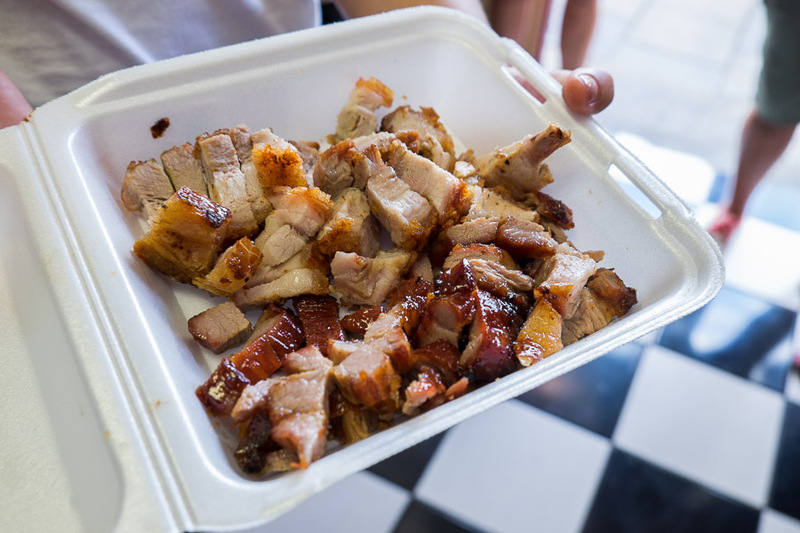 We also had a taste of BBQ pork and roast pork at Char Siu House on Maunakea Street. 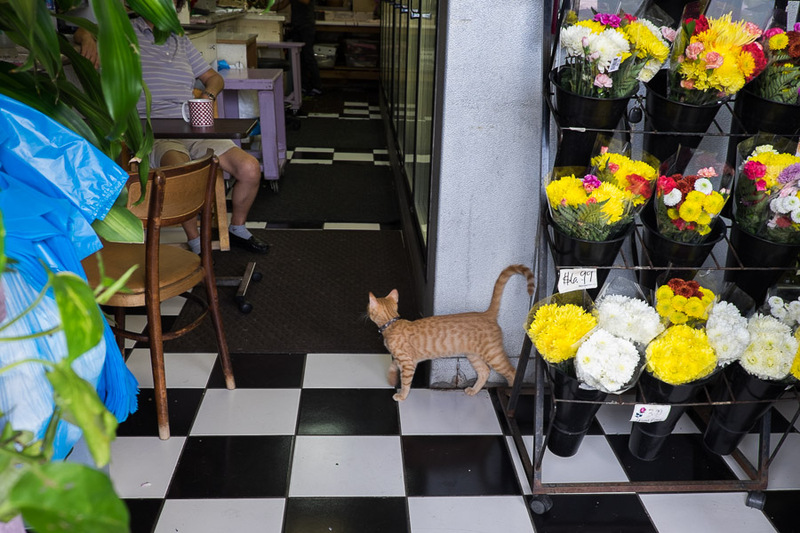 We met a couple of friendly young florist cats and a roly poly pug who squirmed too much for me to take a decent photograph. Our tour also included a stop at a Chinatown lei shop where we learned all about leis (Hawaii’s famous flower garlands). Our final stop was at Leonard’s Bakery for malasadas, Portuguese doughnuts, fresh and warm from the kitchen. Surprisingly light and airy, these doughnuts were rolled in granulated sugar and filled with custard. If you prefer, you can get them rolled in cinnamon sugar or Li Hing powder, and if vanilla custard’s too plain, there’s also dobash (chocolate) and haupia (coconut). 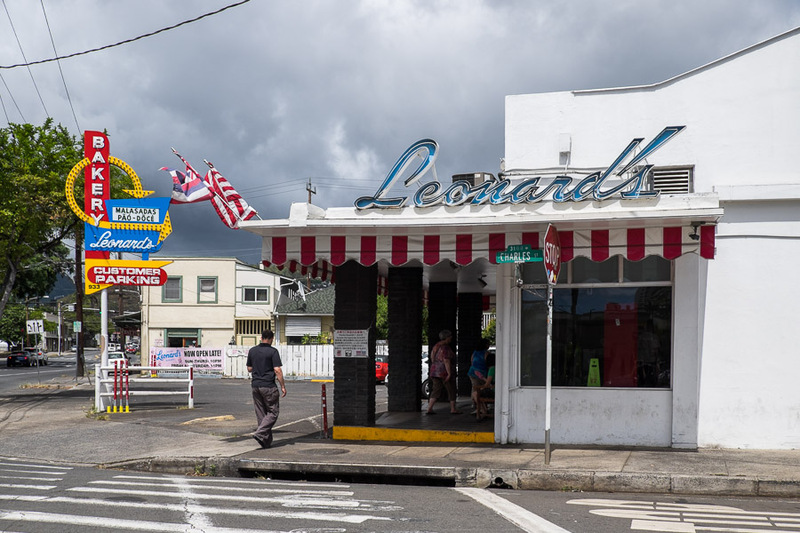 You can get these doughnuts elsewhere, but Leonard’s is Hawaii’s original malasada bakery and has been making them since 1953. 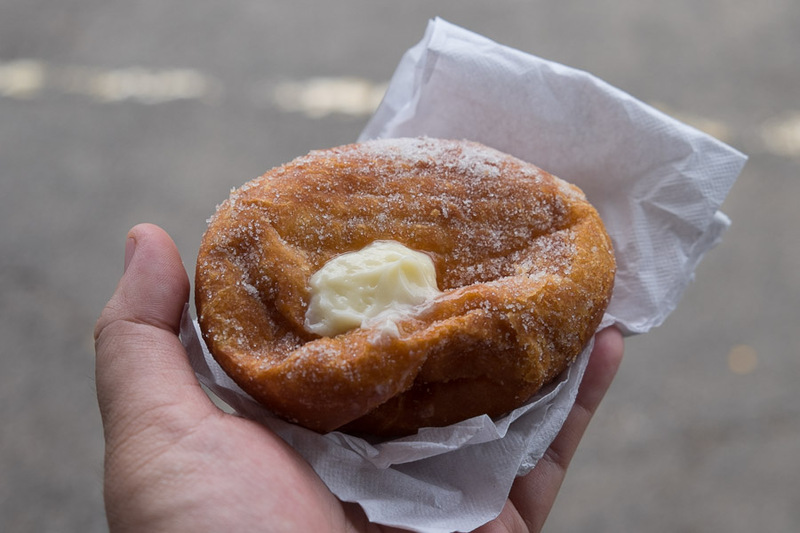 Malasada (Portuguese doughnut) from Leonard’s Bakery – delicious! It was a fun way to spend the day, and as we didn’t rent a car while on Oahu, the real advantage of going on this tour was getting away from touristy Waikiki to all these places to sample these local treats. My top three favourites from the tour: the Korean BBQ chicken and chow funn noodles; the banana lumpia; and the baked manapua. Robin and Krystal explained the history behind the food we ate and places we visited, and pointed out landmarks of interest as we drove around. Afterwards, Krystal emailed all of us a summary of everything we did on the tour, including addresses of the various stops. The email also included links to recommended restaurants for Oahu and the neighbouring islands (Maui, Kauai and Big Island), and a few bonus recipes. 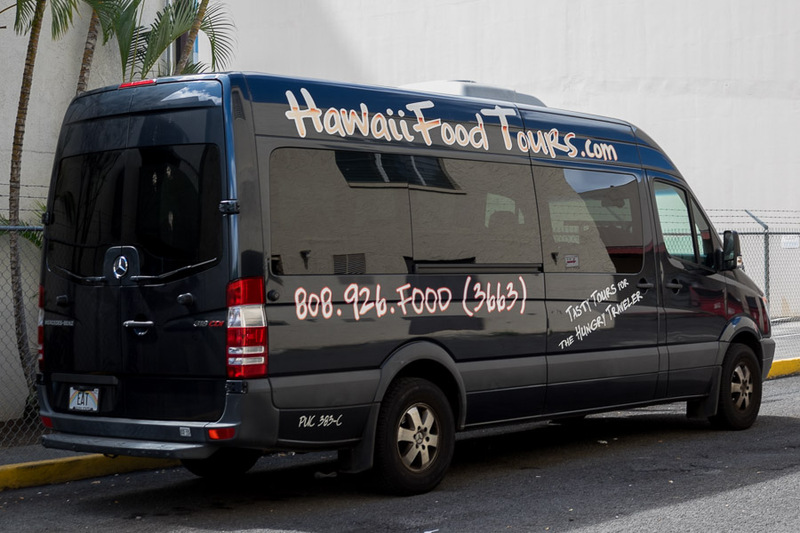 Hawaiian Food Tours also does a North Shore Food Tour – we’ll definitely consider it the next time we visit Oahu. We went on the Hole-in-the-Wall Tour of Honolulu. 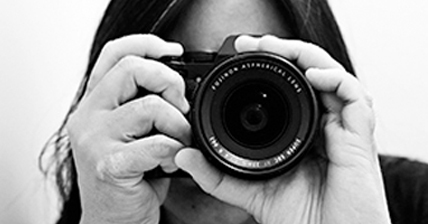 Tours are daily, 9am to 2.30pm. Tour content may vary on the day. Pick-up/drop-off is included for Waikiki hotels. I booked it online well ahead of our trip. I paid US$110 per person at the time – prices have gone up since then (check the Hawaii Food Tours website for latest info). Wear comfortable walking shoes and make sure you’re hungry!